The Teddy bears picnic as most of you will know is a popular children's song which is now over 100 years old as a piece of music. It remains popular to this day with very young children and I'm sure many of you will remember it from your own childhood. The music to this song was first written in 1907 by John W.Bratton an American who was an accomplished composer and producer. Although Bratton usually wrote lyrics himself for his own compositions he did not for this piece of music, instead he sold it as sheet music entitled "the Teddy Bear Two-Step". It sold well and was often used to accompany circus acts. The lyrics were added much later by a British songwriter, Jimmy Kennedy in 1930. Renamed "The Teddy Bears picnic", the song rose to fame and has ever since been a firm family favourite. One of the first every recordings of the song was in 1908 by the Black Diamond Band. The first recording of the song with the lyrics was by Henry Hall and His Orchestra with the song sung by Val Rosing, who later became Gilbert Russell after he moved to America to try his hand at becoming famous in the film industry Listen to this original song here. Anne's version of the song can be heard here along with a video composition of teddy bears having a picnic. John Inman, a comic actor most famous in Britain during the 1970's and 80's for his portrayal of a camp shop assistant in "Are you being served" also recorded a comic version of the song which can be heard below. At the end he mentions some of the famous bears on TV at the time, in a little comic chat with them as they leave the picnic. The song has become so popular world wide that many people have used the concept of a teddy bears pinic as a real day out for all the family. Sometimes in aid of charities, sometimes just for a fun event to help promote a certain attractions. But what does a teddy picnic day out consist of? Everyone must bring a Teddy bear, preferable one which has been spruced up for the day, although shabby teddy's do get more cake and cuddles. A picnic must be brought which should ideally include things which your bear would like to eat too. So cupcakes and honey sandwiches are often high on the list. Teddy related games are usually played such as Hide and seek where you hide your bear and others have to find him. Prizes are given out for the best dressed bear or cutest bear (categories are up to you of course). 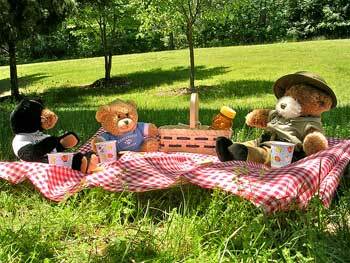 There is even a special Teddy Bears Picnic day celebrated in the USA every year on July 10. I'm not sure how this begun, I suspect a cunning marketing plan somewhere along the line. However it is now a great time to celebrate with our lovable furry friends and family and have a fun day out in the open air with lots of lovely things to eat. Let me know of any teddy picnic events happening near you and I will happily promote them here.